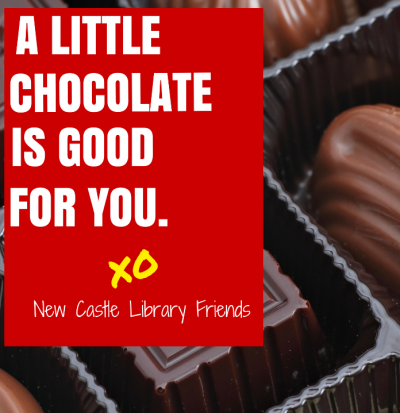 Join the New Castle Library Friends, on Friday, February 9th, from 6:30 p.m. – 8:30 p.m. Sample a variety of sweet and savory chocolate dishes, nosh on delicious hors d’oeuvres, and enjoy the sweet sounds of Fiscal Year. Stop in and celebrate Valentine’s Day a few days early, connect with Library Friends and neighbors, and support a great organization. Please spread the word. Tickets will be sold at the door: $20 for members and $25 for non-members. (Membership can be obtained at the door.) Admission includes two drink tickets; additional drink tickets will be $5 each. Please RSVP at the library or at nclibraryfriends@gmail.com.